and reputation like its shadow. the tree is the real thing." Garage Sale days have been scheduled June 3 & 4, 2016, at the Logan County Genealogical & Historical Society Center, 114 N. Chicago St., Lincoln, IL. The public is invited to attend the sale Friday, June 3, 8 a.m. until 4 p.m. and Saturday, June 4, from 8 a.m. until 2 p.m. to peruse an extensive collection of historical and household items. Members and friends are asked to drop off donations beginning Monday, May 23, from 1:30 to 3:30 p.m. Items will be accepted Tuesday, Thursday, and Friday from 11 a.m. until 5 p.m. On Wednesday, items will be accepted from 1:30 to 3:30 p.m. The following week donations may be brought in during regular hours and every afternoon from 1:30 to 5:30 p.m. Members having a card table or folding table are asked to take them to the Center as soon as possible. We also need volunteers from 2 to 3 p.m. Saturday, June 4, to assist with take down and delivery of unsold items to thrift stores. Please phone 217-605-0011 or the LCGHS Center at 732-3200 for questions or volunteer information. Lincoln, Illinois, Feb. 11, 2016. 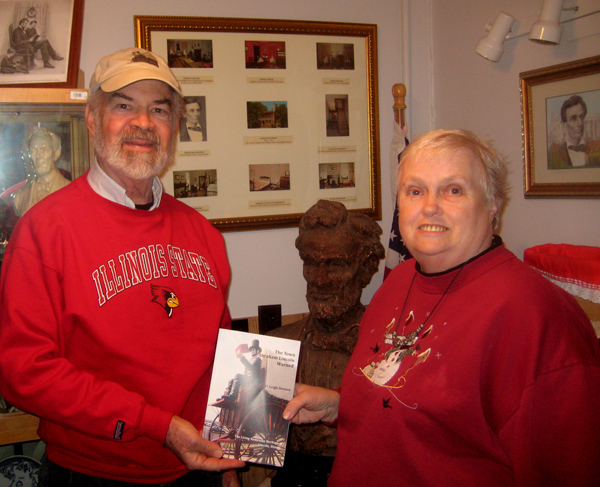 D. Leigh Henson and Diane Osborn, president of the Logan County (IL) Genealogical & Historical Society, hold a copy of his book The Town Abraham Lincoln Warned. He donated copies to the Society. Henson and Osborn stand in the Society’s Lincoln Room, which contains various Lincoln mementoes of local and national significance, including the bust in the background: http://findinglincolnillinois.com/lincolnstatueplan.html#lincolnbust. 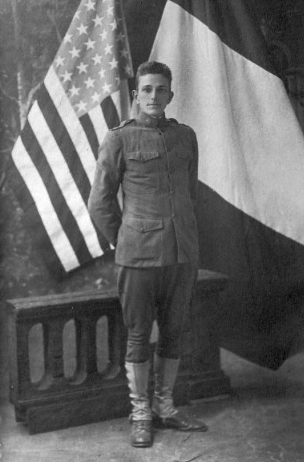 January 26, 2016 – With about a year remaining before the observance of the centennial of the U.S. entrance into WWI, the Logan County Genealogical and Historical Society is requesting help with identifying photographs of soldiers and inductees from Logan County. The ribbon shown in the first slide is one worn by some of the inductees in the photographs. It notified railroad staff that the U.S. government would pay for their transportation to camp. 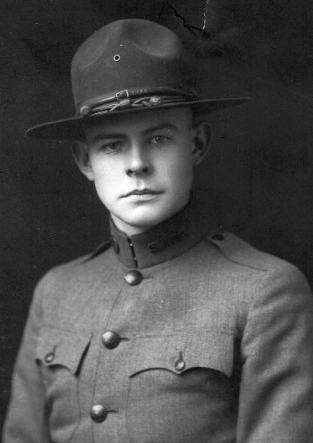 Researcher, Bill Donath, is working on a book about the Logan County activities that took place during that time in support of the war effort and the men and women who served in some capacity during the war. The book is nearly complete and is planned for availability this Fall. 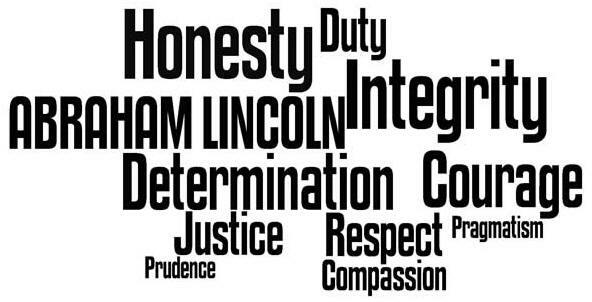 Anyone wishing to submit photographs or stories about the men and women who served during WWI can submit those to Bill Donath at LCGHS, 114 N. Chicago St., or by email: wdonath01@hotmail.com. Bill will be available at LCGHS on Fridays from 11 am to 4 pm. Please contact Bill before bringing items to LCGHS. Phone: 732-9881 and leave a message. Anyone with information regarding the soldier photos in the slide show may also contact Bill at the above mentioned locations.